Last Friday, I attended an open mic event and hid inside a “Tree Spirit” costume. I sat at the back of the room, as far away from the open mic podium as possible, and scanned the audience. Not everyone wore a costume for this Halloween event but many had. Glossophobia is the fear of public speaking. Makes you feel like you’re in the middle of a horror movie! On my right, a black-wigged man in a red housecoat held what appeared to be the skeleton of a cow’s head. On my left, a woman arrived as a social media butterfly. 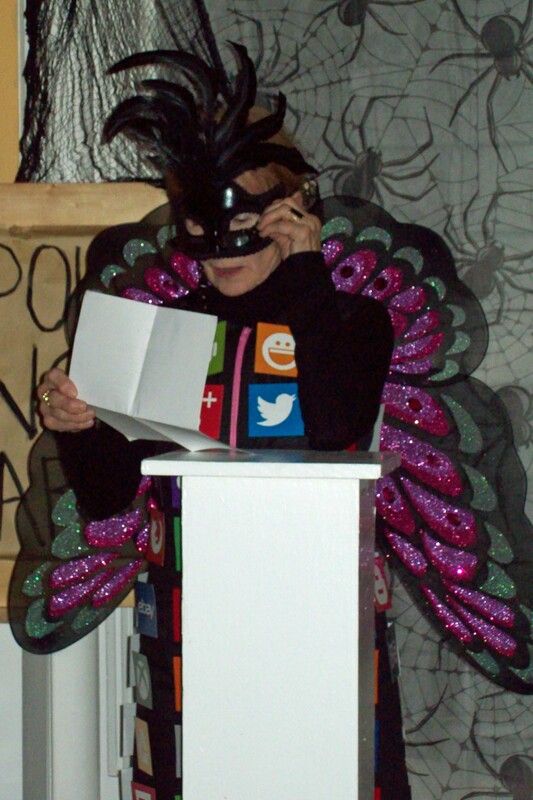 Her back dress was adorned with social media logos. Writers are indeed a creative bunch but those who are introverts (and many are) may limit their exposure to social settings so that they can relax with their writing at home. Did I mention in my early twenties, I dressed as a bookworm so I could sneak into a quiet corner of a party and read? That’s another story. For some, standing in front of an audience and reading a poem or story is frightening enough. Would wearing a costume and a mask make it easier? Yes and no! Some masks (like my own) made it difficult to see my notes. Not all writers are social or even social media butterflies. Open mic events provide emerging poets, authors and musicians a safe place to experiment and test out new material with a supportive and encouraging audience. I don’t know when I lost my own jitters for spoken word events but I do recall the transformation of others. Years ago, one reader was so nervous about reading his work that one of the co-hosts of the open mic offered to read his work for him. When he discovered the audience embraced his words, he eventually found the courage to read at future events. Today, he not only offers to read the work of other new guests but has learned to work the stage and tell stories without a script in front of him. In London, Ontario, Stan Burfield who publically wrote about his transformation as a shy and nervous open mic reader is now one of the key organizers behind London Open Mic Poetry Night a successful open mic event that often draws over 60 people each month. He is also helping other introverts to share their work in a warm and accepting environment and is looking for ways to branch out into other areas such as organizing open mics for prisoners. For me, studying theatre as a child and as an adult helped me to face an audience with a memorized script. An organization like Toastmasters International could help with ad lib performances. Its website offers excellent articles and suggestions for public speaking. Spoken Word at the Lawrence House Centre for the Arts was introduced by literary board members the late Peggy Fletcher and the late Hope Morritt. It is now co-hosted by poet/photographer Melissa Upfold. Read something you’ve written, something from your favourite author/poet or just sit back and listen. Photo courtesy – The Calculated Colour Co. Attending and sharing work at a literary open mic event such as Spoken Word Sarnia also provides necessary practise in refining one’s skills. Watch how other people present themselves. Experiment to see what works and doesn’t work to entertain the audience. Try reading and sharing the work of a favourite writer then build up to presenting your own original material. Unless it is a slam or spoken word contest, most open mics welcome new and emerging writers. For those who are serious about his/her writing, open mics offer friendship and encouragement from other writers. More experienced authors and poets are there to help or mentor you. Most can relate to their own first experiences. If you like to travel, open mics in other locations provide new opportunities for learning and networking. Of course, open mics aren’t for everyone and even at my age, I am still forever learning. For those in the southwestern Ontario area, this November offers some unique opportunities to share your work. What are you waiting for? TONIGHT (Wednesday, November 4) IN LONDON: Now in its fourth season, London Open Mic Poetry Night presents a spotlight feature with poet Charles Mountford followed by an open mic. A wide range of ages and styles. Check out their website. Facebook event info here. 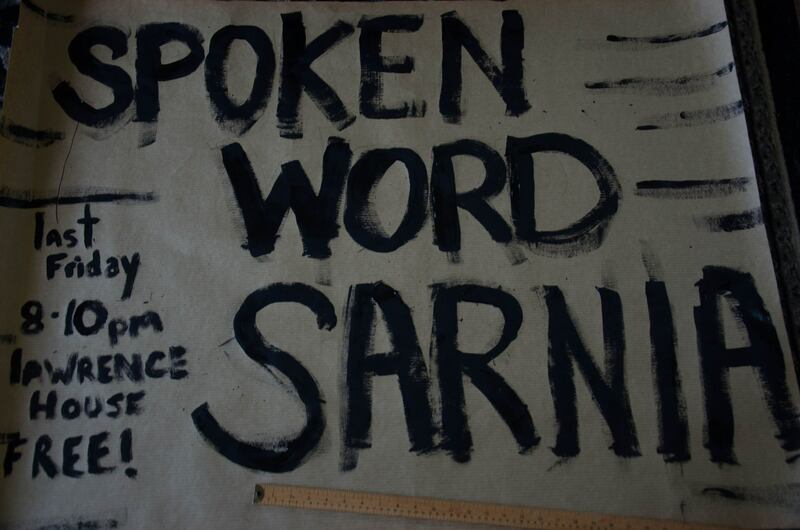 FRIDAY (November 6) IN SARNIA: For the first time, Spoken Word Sarnia will be highlighted during Sarnia’s First Friday event at the Lawrence House Centre for the Arts. 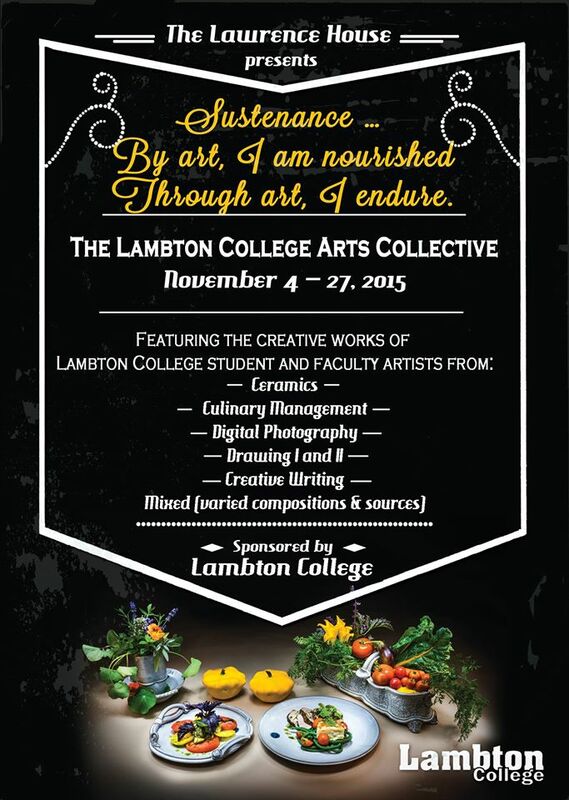 The three-hour ( 6 p.m. to 9 p.m.) event is being held in conjunction with the month long Sustenance art show featuring the creative works of Lambton College Student and Faculty Artists. The Spoken Word Sarnia portion will present video poetry as well as readings by local poets, musicians, storytellers and other presenters followed by an open mic. See the Facebook event listing here. SATURDAY (November 7) IN LONDON – Guerilla poetry in the morning. See info here. Featured guest poet Lucas Crawford followed by open mic. Music start time: 7:30 p.m. Reading info here. Facebook event info here. Both events are part of the three day celebration WORDS: the Literary and Creative Arts Festival. More Facebook event information here . The official website is here. SATURDAY (November 7) IN ST. THOMAS: For those interested in invasive species, Morel Magazine is hosting a community event. An afternoon reading with poets Julie Berry and Tanis Rideout will be followed by an open mic event. More info here. SUNDAY (November 8) IN DUNDAS: Tower Poetry Society hosts its annual Art Walk in collaboration with the Carnegie Art Gallery in Dundas. Some opportunities to share poetry. Contact info here. NOVEMBER 27 (Friday) IN SARNIA: Spoken Word Sarnia is held on the last Friday of every month at the Lawrence House Centre for the Arts. This season’s co-host is Melissa Upfold. See the Facebook page here and the website here. The Ontario Poetry Society has helped many grassroots poets to hone their skills including public speaking at its members’ readings and open mic events. DECEMBER 6 (Sunday) IN TORONTO: The Winter WarmUp Poetry Gathering! The Ontario Poetry Society, a grassroots poetry friendly organization advertises several members’ readings and open mic events throughout Ontario. Previous events have been held in Oakville, London, Sarnia, Stratford and other locations. 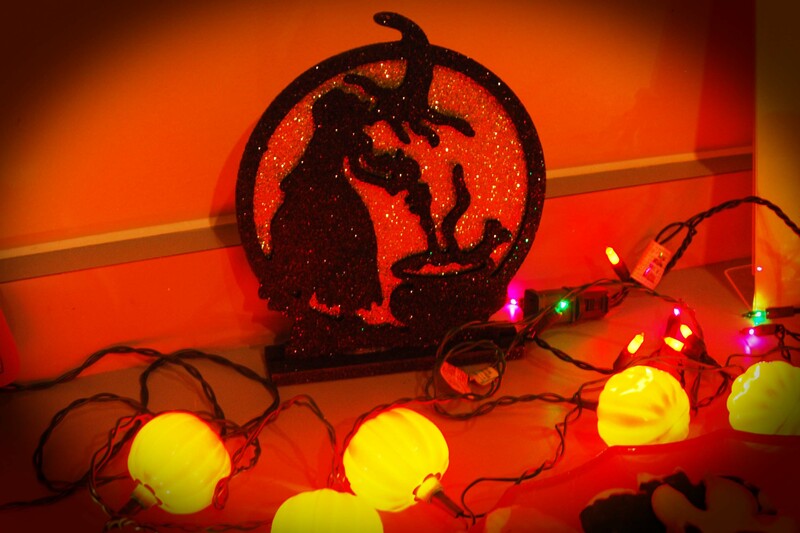 More info about the December 2015 event here. For those interested in sharing work in a competitive environment, check out the poetry slam and spoken word competitions in the area. For storytellers, there’s Mouth Piece – Put Your Story Where Your Mouth Is, a Windsor/Essex County based storytelling series organized and hosted by Vanessa Shields. Additional information can be found here. Future literary events can also be found on my literary events page. Check back frequently as postings are added when I can squeeze in the time. Apologies re: those events I may have missed or have not been informed of. Highlights of some of these events may appear in future blog posts. I’ll be working on my backlog soon! This entry was posted in blog posts, News-Events and tagged Open Mic, Poetry Events, Spoken Word, The Ontario Poetry Society on November 4, 2015 by d78hill. good article, Deb. I once read that next to death, our biggest fear is public speaking. Agreed!